with the secrets of scary people. 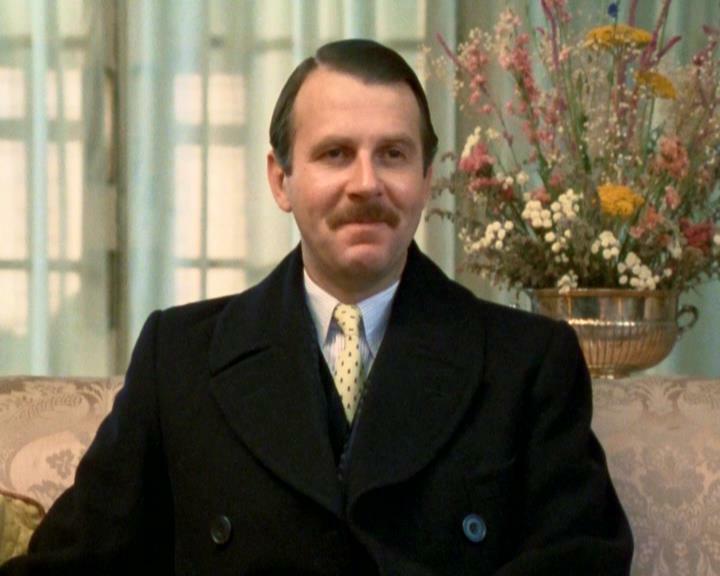 Another great character actor is Tom Wilkinson. So I'm watching Batman Begins, and Tom Wilkinson's name pops up on the screen. "Good heavens," say I, "Tom Wilkinson? He's a British actor who does Joan Hickson Miss Marple films!" (Actually, he's done one: Pocketful of Rye). So, I look him up and realize this guy has been all over the place. I saw him in The Importance of Being Earnest, I saw him in Shakespeare in Love, I saw him in an Alleyn mystery. He was in Sense & Sensibility, Prime Suspect 1 and of course Batman Begins (as Falcone). Wilkinson is one of those extremely talented British actors, like Bamber, who can morph into any role and so effortlessly, you don't notice. His most telling quality, however, is a capacity for delivering dry lines. In Pocketful of Rye, as Inspector Neele, he makes several caustic remarks about rich people and crazy suspects. From mafia boss to British barrister . . . remarkable actor.